The U.S. midterm elections are only a few weeks away and a lot is at stake for the energy industry. It isn’t just the fate of the U.S. Congress that is up for grabs, although that is incredibly important. There are also 36 governor’s races, state legislature races, and a raft of ballot initiatives that will have a direct impact on oil and gas. The results will have enormous implications going forward. The Republicans currently control 33 governor’s mansions, but that could soon change as most polls indicate significant wins for the Democrats are in the offing. For instance, as InsideClimate News points out, Nevada, New Hampshire and Maine all saw their legislatures pass renewable energy initiatives over the past year, only to have them vetoed by their Republican Governors. Those policies could quickly move forward if the Democrats take over in those states. The same could be true in a series of other states if power changes hands. Then there will be questions related to the energy industry that will be directly decided by voters. Perhaps the most consequential ballot initiative affecting the oil and gas industry is in Colorado, where voters will decide on greater setback distances for oil and gas drilling. Initiative 97 will require drillers to stay a minimum of 2,500 feet away from “occupied structures,” including houses and parks, up from just 500 feet currently. Because so much drilling in the state takes place in densely populated areas, the industry is decrying the initiative as one that could potentially kill off the drilling. But a house explosion from a residential gas line in 2017 that killed two people has galvanized drilling opponents, who have called for stricter regulations. 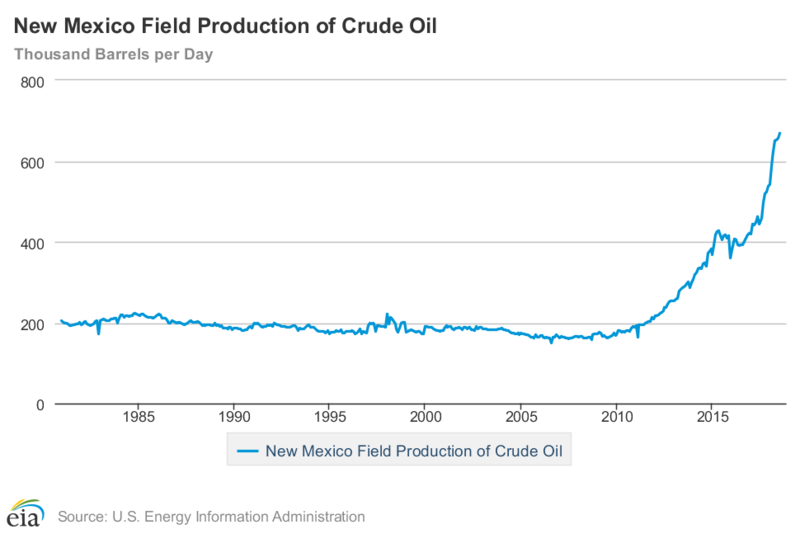 The choices are also stark in New Mexico, which hosts part of the Permian basin and has seen oil production more than double over the past four years to 670,000 bpd as of July 2018. As InsideClimate News points out, the Democrat running is promising a “renewable energy economy” while the Republican is heavily backed by the oil and gas industry. Indeed, he actually owned an oilfield services company. Then there is the carbon tax in Washington State, which seems to have sparked somewhat of a panic from the oil and gas industry. Texas oil companies have reportedly mustered more than $17 million in spending to oppose the measure, according to the Houston Chronicle. Phillips 66, Andeavor and the U.S. subsidiary of BP have marshalled resources to defeat what could be the first carbon tax in the United States. The tax would amount to $15 per metric ton of carbon placed on large emitters beginning in 2020, a levy that would increase by $2 each year and would be adjusted for inflation. It would impact fossil fuels sold or used within the state. It would also apply to electricity generated in Washington as well from sources imported from neighboring states. State officials believe the tax will raise $2.2 billion in revenue in the first five years, which will be reinvested in public transit, energy efficiency and renewable energy. Related: How Much Spare Capacity Does Saudi Arabia Really Have? Meanwhile, the federal races are also not to be overlooked, although the impact will be a little more ambiguous. The U.S. House and Senate are on the line, and while Democratic wins would not likely translate into a major shift in policies, given that Donald Trump would still occupy the White House, it could slow the deregulatory effort underway in Washington. If the Democrats took majorities, they could launch investigations into the agencies that oversee regulatory policy for oil and gas (namely the EPA and the Interior Department), they could block Trump’s nominees to agencies, as well as his future judicial appointments. At the risk of venturing even further into speculative territory, the results of the 2018 midterms could have an enormous impact on future environmental and energy policy following the 2020 electoral cycle, especially with the 2020 Census and redistricting taking place. Democratic majorities sealed this year could even pave the way for clean energy legislation and attacks on oil and gas should the next president be a Democrat. In other words, the impact of the November elections could be profound, but hard to predict from the vantage point of today. Thus, the oil and gas industry has its sights set on damage control at the state level, where there are a series of elections and ballot initiatives that could have a direct and immediate impact. No, let's not give news sites yet another opportunity to cause oil to go up even further. Everyday the headlines just throw out "Oil up on Iran sanctions" and if that doesn't bring prices up then it's back to "But, Venezuela..."
Venezuela problems have already been priced in $10/bbl ago (literally several months ago). Officially, the sanctions on Iran don't even kick in until November 4th. True, some countries have either halted buying or limited their oil purchases from Iran already, but that means that they can afford to do so. I refuse to believe that just 1 or even 2 countries (Iran and/or Venezuela), neither of which produce the most within OPEC, are somehow causing the entire global supply of oil to be thrown off into serious deficit. Let's be clear: It's nothing more than hedge fund managers who have all agreed on a $100/bbl target. So, no...we don't need more headlines unnecessarily causing oil prices to rise any further. Indeed, the seeds of dissatisfaction about lots of different things-oil, are being planted. The price of oil is going up and will probably continue to go up. Oil is not getting any easier or cheaper to put in a barrel and refine. Pollution indicators are up. The current administration thinks it's OK to have copious methane leaks and flaring. Meanwhile, regular ole combustion still put carbon into the atmosphere in the same ratio to the fuel burned, as ever before. Oil keeps some pretty dubious friends. Putin sells oil so he can brandish his weapons around the world. Russia is back! Venezuela has few friends as it suffers from the resource curse and its consequences. Iran, similar as Russia, buys the wrong things with its oil, seriously upsetting most regional neighbors. The benefits of burning oil are still here. But downsides are ascending. Time for a new energy plan. Coming elections do suggest the possibility of new direction. Somethings a little sick about present energy policy.